Currently settled in 7central room 220 watching Emily sleep from Benadryl induced! 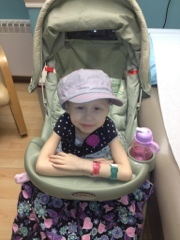 Emily woke up in a pool of blood this morning from extremely low platelets! Scared the crap out of us this morning but learned it was just platelets! We were in no hurry to get to the hospital this morning but arrived in to get platelets and some antibiotics! Everyone coming in to look at the spots! There are speculations of what the spots are but no one knows for sure! Dermatologist came to look at them and took pictures and we didnt get much from them at this point! Tomorrow they will do a biopsy at 9am and they said it will take about a week to get the results! Emily is doing well except for the extreme pain in her leg and foot! She is eating well just not walking and we are carrying her where she needs to go! As long as you don't touch her spots she is fine! We will continue to keep you updated! We will have her Mibg scan this week and get to find out more and really get a sense of what is going on! Hug and love your kids and tell them how much you love them! Please continue to keep Emily in your thoughts and NO PROGRESSION! I cannot even imagine how the waiting messes with you. I am so sorry but praying and thinking GOOD NEWS for all of you. Hang in there!!!! Praying and fasting for you Emily!! We are praying for you guys!! Stay strong all of you! Hugs, and prayers and good thoughts to all of you. We are praying for you guys!! Stay strong all of you! Sending hugs and happy thoughts and prayers to you all. You are in our family's thoughts! Lots of prayers to you all Shannon. I continue to be inspired by Emily :) Thank you for all of your posts keeping us updated. We think of you every day. Stay strong Emily.